Las Vegas (November 1, 2016) – McMahon’s Best-One Tire, an independent tire dealer with 3 locations across northern Indiana, has been named the Finalist for the 2016 Tire Review Top Shop Award. Now in its tenth year, the Tire Review Top Shop Award, presented by Coats, seeks to honor the “best of the best” independent tire dealers in the U.S., Canada and Mexico. McMahon’s Best-One Tire, with three locations serving Fort Wayne and northern Indiana areas, was founded in 1969 by Patrick McMahon, Jr. The business today is owned by Patrick J. McMahon III, Randy Geyer and Mark Zurcher. The prestigious honor was announced at the Tire Industry Association’s Tire Industry Honors Awards Ceremony in Las Vegas last night. Tire Review’s Top Shop contest evaluates dealers of all sizes and types, honoring independent tire dealers that best epitomize the key attributes and values of a highly successful business that are an ideal representative of the industry in the areas of: customer service and retention, training and education, merchandising and promotion, professional standards and conduct, appearance, solid business management, community involvement, business growth, achievement and innovation. “We are honored to be one of the finalists. As an independent tire dealer, and family owned business, it can be difficult to compete with the ‘big box’ stores, from Wal-Mart to Discount Tire and company stores,” explains Kim McMahon, company president. “This award is another way to differentiate ourselves, to show that we’re doing business the right way. We have always tried to go above and beyond for our customers, and just as importantly, for our employees. The Top Shop Winner this year was Lex Brodie’s Tire, Brake & Service Co. Based in Honolulu with five locations, Lex Brodie’s has been locally and nationally recognized for its commitment to the community and exceptional level of customer service. Bud’s Tire Pros, with 3 locations serving the Riverside, California area. Founded 20 years ago, the dealership is owned and operated by Bud Luppino. Dunn Tire, with 30 retail locations and five wholesale distribution centers in Buffalo and northern New York region including Erie, Penn. Founded in 1973 by James Dunn, the dealership is owned by a group of investors led by Randall L. Clark, president & chairman of the board. “The level of competition was incredible this year, so I’m very proud of our finalists, among the best-of-the-best tire dealers out there,” Renner continued. “Year after year of this competition, the North American tire dealers continue to raise the bar when it comes to professionalism, dedication and innovation. They work very hard at setting a high standard among businesses of all types – even beyond our industry. They have a lot to be proud of. Three Finalists will each receive a Coats wheel balancer or tire changer of their choice, a $1,000 cash prize, a feature story on the dealership in the October issue, and a specially designed finalist trophy. The Top Shop winner receives the Coats wheel balancer or tire changer of their choice, a $2,500 cash prize, airfare and hotel for two (2 nights/3 days) to the 2016 Global Tire Expo/SEMA Show in Las Vegas, a feature story on their business in the October issue of Tire Review, and a specially designed trophy to display in their stores. For the 2016 Top Shop Award, Tire Review accepted entries from January 1 through July 3. From the full group of over 130 entrants, judges selected 25 semi-finalists, which were then required to complete an extensive entry form and provide details about their business, including: size, sales mix, merchandising techniques, customer service, training, achievement, and their role in their community. From there, eight semi-finalists were chosen for final judging by an independent panel of judges. 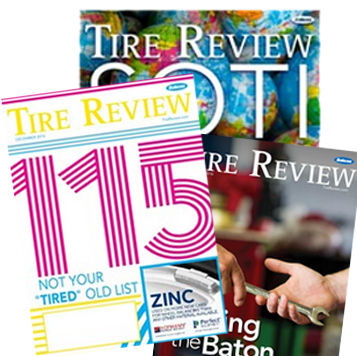 Celebrating its 115th year of continuous publishing, Tire Review (tirereview.com) is the oldest, most widely read B2B magazine serving the tire industry in the world. Tire Review magazine, published by Babcox Media, offers in-depth information pertaining to all aspects of operating and growing a successful dealership – including business operations information, marketing and sales insights, product applications, technical service-related issues, tire industry research, and annual directories and guides. Babcox Media is a major B2B publisher that covers the tire, automotive parts and service, truck fleet, power sports, collision and engine building segments with an array of B2B magazines, digital media and video products.